A big thanks to Swiss Story Blog, who named this blog, One Big Yodel, her number one pick for the Bluefish's Awesome Blogging Award. On her blog, Swiss Story wrote of One Big Yodel, "I gave her a shout out not too long ago, and she is still one of my favorites at the moment. She talks about her life in Switzerland with such humor and characterizes the Swiss' cultural trites almost too perfectly." 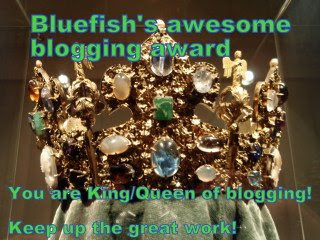 The award originates with Bluefish. Thanks to all my readers for their support and comments. I look forward to taking all of you on my continued adventures in Switzerland and Europe. Cheers. Thank you for mentioning my blog on yours. Thanks for creating a great award.